The Deluxe Rooms are thoughtfully designed for the business traveler. They are equipped with comprehensive facilities including data ports, two-line telephone extensions, electronic safe, and speaker phones with international direct dialing facility, voice-mail, and broadband wireless Internet connectivity. The rooms have Prego flooring. Sinfully comfortable, a Deluxe Room has all the modern conveniences including a work area with a desk, a two-line telephone and a high-speed Internet access. All this makes this set of rooms ideal for staying in-touch while travelling on business or leisure. 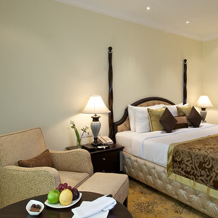 So , Whether Business or Pleasure Taj Krishna , Hyderabad is one of the best 5 star hotels in Hyderabad to stay.